Introduction. 1. The current status of plant tissue culture (Trevor A. Thorpe). 2. Organogenic differentiation (K. Tran Thanh Van and T.H. Trinh). 3. Somatic embryogenesis (M. Terzi and F. LoSchiavo). 4. Applications of somatic embryogenesis and embryo cloning (S.A. Merkle, W.A. Parrott and E.G. Williams). 5. Role of artificial seeds in alfalfa breeding (Keith Redenbaugh and Keith Walker). 6. Regulation of genes in differentiation (L.D. Owens and A.C. Smigocki). 7. Tissue culture in relation to ornamental plants (P. Debergh, J. Roggemans and R. Standaert-De Metsenaere). 8. Clonal multiplication of woody perennials (K. Paranjothy, S. Saxena, M. Banerjee, V.S. Jaiswal and S.S. Bhojwani). 9. Anther and pollen culture (R.S. Sangwan and B.S. Sangwan-Norreel). 10. In vitro gynogenesis (H.Y. Yang and C. Zhou). 11. Production of industrial compounds (Y. Fujita). 12. Cytogenetics of plant cell cultures (V. Nuti Ronchi). 13. Application of tissue culture variability to crop improvement (J. Semal and P. Lepoivre). 14. Somatic hybridization and cybridization (Y.Y. Gleba and L.R. Shlumukov). 15. Genetic engineering of crop plants (D.S. Brar and H. Uchimiya). 16. Zygotic embryo culture (M. Monnier). 17. In vitro conservation of germplasm (Brian W.W. Grout). 18. Expectations of plant breeders from tissue culture (G.S. Khush, S.S. Virmani and D.S. Brar). 19. 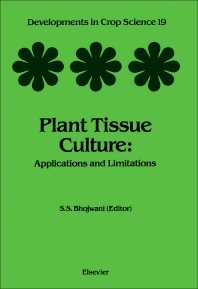 Plant tissue culture in the twenty-first century (Kenneth L. Giles and David D. Songstad). Author Index. During the past decade, Plant Tissue Culture (PTC) has attracted considerable attention because of its vital role in plant biotechnology. PTC offers novel approaches to plant production, propagation, and preservation. Some in vitro techniques are being applied on a commercial scale while many others hold great potential. Consequently, the literature in this area has grown rapidly.